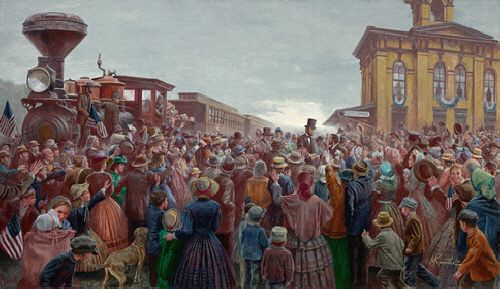 Mort Künstler Hand Signed and Numbered Limited Edition Print and Canvas:"Mr. Lincoln Comes to Gettysburg"
Image Dimensions: Limited Edition Print Image size: 17" x 29 1/4" / Overall size: 22" x 33" Canvas Sizes: 16" x 28", 19" x 34" , 22" x 38" and 32? x 55?. About the Edition : Mr. Lincoln Comes to Gettysburg, November 18, 1863 by Mort Kunstler. The train that brought the president to Gettysburg, also carried his secretaries, three members of his cabinet, a number of foreign ministers and members of the military from Washington and Baltimore. Despite his stately appearance, the president felt fatigued from his trip and was later diagnosed with a mild case of smallpox. In addition to the war effort, he was also worried about his son, who was ill at the time. Upon his arrival, Lincoln was handed a telegram that lifted his spirits. Tad was feeling much better. The next day he would deliver his famous Gettysburg Address, which has been celebrated and has reverberated for the following generations as one of the most poignant speeches in American history.